Once I got the kitchen cabinets home I had to decide how to put the set together as a kitchen. I didn’t have a big garage nor work shed in which to do the construction. Luckily the driveway was paved. A few minutes of push broom and the pavement was clean enough to begin construction. The first decision was how high could the cupboards be made to stand? We did not have a separate sound stage so if the set had to be in a room in building it had to be less than eight feet high. I settled on seven feet high (2.134 meters). With my wife, Corinne’s help we laid out the cabinets in a form that we thought would work. 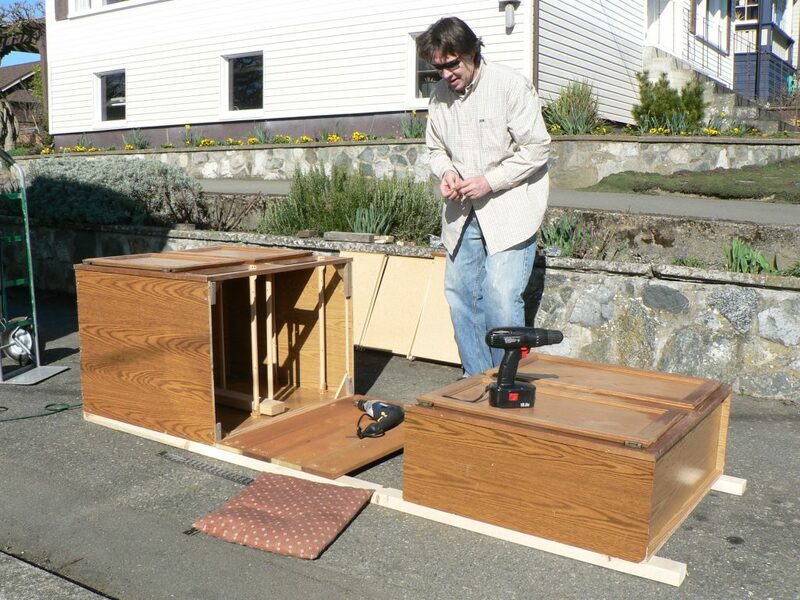 I bought eight two by fours and eight fencing boards and began screwing the cabinets together with my portable drill. I began work. And it worked. No too bad for a guy who is not the best carpenter. I was satisfied. Happy wife . . . happy life.